Today’s guest on Inner Source is Briar Grace Lee from Anna Marie Kittrell’s latest novel, The Commandment. Briar, it’s good to have you here today. Tell us a little about your life. Where are you from? What is life like in the time in which you live? What difficulties do you face? Thank you for having me, I’m honored to be a guest on Inner Source. Your site is such a wonderful and informative resource for believers. However, just weeks ago, you would not have been allowed to host me on your blog without being harshly interrogated and likely, arrested. Although drastic changes have taken place in the U.S. since the fall of the OLG, in the back of my mind those old fears still linger. In fact, at this very moment, I find myself wondering how long it will take for this interview to be flagged and reported to authorities. Until recently, Operation Level Ground ran surveillance on every email, video stream, blog, social media site, text message, phone call, and all other means of electronic communication to ensure nothing Christian-oriented slipped past. The severity to which you would have been punished by sharing my story disturbs me even now, though the threat of Christian persecution no longer exists. As you earlier stated, my name is Briar Grace Lee. The year is 2050, and I am currently eighteen years old. I am an only child, born and raised in Greenfield, Oklahoma. My middle name, Grace, is in honor of my grandmother, with whom I was extremely close. She lived with my family up until the time of her death, when I was seven. She died just three days before she was scheduled, by order of the Commandment, to receive the government-mandated vaccine known as SAP (Serum to Advance Progressivism) an injection formulated to erase God from the mind. I’m convinced she asked God to take her before that day arrived. Immediately following the death of Granna Grace, I was placed under house arrest and ordered to wear an ankle monitor (or, shackle, as I preferred to call it) because my body rejected the SAP vaccine. Every six months from the age of seven to seventeen, I was forced to undergo another vaccination. My body resisted the serum each and every time. A few weeks before turning eighteen, my mother and I were informed that because of my body’s continual resistance to SAP, I would be institutionalized on my birthday. I would become a permanent resident of the ARC (Alternative Research Center), a facility shrouded in dark rumors of torture, experimentation, and death. My only alternative was to accept a last minute ultimatum to become a laboratory test subject for a new God-dissolving serum. And that’s where my real story begins. Your story is a compelling one, a warning to those of us who live in a world where God’s Truth is being seen as the enemy, where God’s people are called self-righteous and our values are degraded. Your grandmother was a strong influence on your life, so I’m not going to ask what you would do. I’d like to know what your granny, who lived in this time, would tell us to do in order to prepare or to resist what would be coming our way. In order to prepare for or resist against what is coming our way, Granna Grace would have first and foremost encouraged believers to read the Bible. Having spent her life in God’s word, she knew the day was quickly approaching when the Bible would be stripped from our hands and banned from our eyes. What she didn’t know, until shortly before her death, was that God’s sovereign word would also be erased from the minds of most of our country’s population. Nonetheless, Granna Grace had prepared me for this occurrence not only by teaching me to memorize scripture, but by sewing a miniature Bible into the small stuffed animal that hangs on my keychain. Who knows whether you have come here for such a time as this? This verse from Esther, chapter four, was one of Granna Grace’s favorites. I will always believe that my body’s resistance to SAP is a direct result of my grandmother’s prayers. She believed God places us where we are for a reason—and that all of our attributes are vital to His purpose. There are no accidents. The one aspect of the story that I noted was that despite the world’s dislike for Christians, there were those who still believed in God. Yet there were individuals who had been a part of what your world required of them so that God would, in the world’s misdirected belief, cease to exist, but they were good and kind. In your world, what did that mean to you? I believe that in this aspect, my future world of The Commandment and your current world are relatively the same. Despite the dislike and disrespect Christians (Unlevels, in my world) sometimes endure in society, believers continue to place their faith in God. Just as those resistant to SAP in my world, the believers in your world feel Christ in their spirits and experience His presence in their souls. How is it possible to deny a part of one’s own being? In The Commandment’s future world, the entire population is injected with a chemical that numbs the area of the brain that houses Christian beliefs. We who remain resistant to the vaccine know that we will endure experimentation and death. Even so, the “God Zones” in our brains light up like Christmas trees every time we think about Jesus. The belief can’t be shrugged away or brainwashed from existence—even if, on a superficial level, we wish it could be. It’s there to stay. On the other side of the coin, are those who do not believe in Christ, but are still good people. Your world (and mine) is filled with unbelievers who sacrificially give to and provide for their fellow man—oftentimes out-serving those of us who are Christian. Thank God for these people. I can only imagine how much more they would bless and be blessed if influenced by the power of the Holy Spirit that comes through believing in the saving grace of Jesus Christ. In The Commandment, as in today’s society, people have many “good reasons” for not believing in God. Lukas, the medical scientist I’ve been assigned to, leans upon science, the medical field, and his own intelligence as practical proof that God doesn’t exist. It is only through building a relationship with me, a believer, that Lukas is ultimately persuaded to seek a relationship with Christ. Witnessing my faith at work, watching as God directs my life and shapes my future, is a truth he can’t reason away. And just like in your world, when Lukas earnestly seeks Christ, he finds Him, and is able to experience not only the transformation of his own life, but aide in the transformation of countless other lives. On the other hand, there were individuals who were, for lack of a different way to say it, gnashing their teeth and spitting at the face of God, angry and vengeful. Why do you think that is? As in your society, many people in The Commandment resented any mention of the existence of God and—more specifically—the existence of sin. In my world, this resentment came from the detestation for being told what to do. Not only did society not want to be held accountable, they did not want accountability to exist. Period. I suspect these sources of resentment in relation to God are not so different in your world. Briar, you are a strong heroine, but at times you shared with us that you felt weak. Then strength would return. Can you explain why that occurred? I believe the times when I am strongest and most victorious, are the times I let go of myself and depend fully upon God. The moment I begin questioning my strength and abilities, fear and weakness set in. Acknowledging that God is strongest when I am weakest perplexes my mind. It is for that reason that I leave my mind—God Zones and all other zones—to God. Ten years ago, Briar’s body rejected a government mandated vaccine known as SAP (Serum to Advance Progressivism), formulated to erase God from the mind. Briar was seven years old. She’s been on house arrest ever since. Now, just weeks from becoming a legal adult, Briar remains non-responsive to her mandatory SAP injections. Along with her rapidly approaching eighteenth birthday looms a grim reality: by order of the Commandment, adulthood means institutionalization for those resistant to SAP. In a matter of days, Briar will become a permanent resident of the ARC—a facility shrouded in dark rumors of torture, experimentation, and death. Her only alternative is to accept a last minute ultimatum to become a laboratory test subject for a new God-dissolving serum. With a decade of solitude behind her and a lifetime of confinement before her—what does she have to lose? Except maybe her soul. The Commandment is available for pre-release this week, not only from Anna’s publisher, Pelican Book Group, it can also be purchased from other fine book retailers including Amazon and Barnes & Noble. Anna’s newest novel will release this Friday, August 24. Anna works as a middle school secretary in her beloved hometown of Anadarko, Oklahoma, where she resides with her high school sweetheart-turned-husband, Tim. 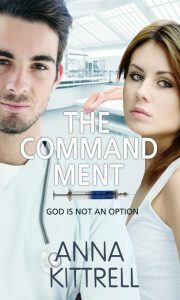 She has nine books in publication, including her new Christian futuristic thriller, The Commandment. Anna has written for as long as she can remember. She still has most of her tattered creations—stories she used to sell on the playground for a dime, written on notebook paper. Her love of storytelling has grown throughout the years, and she is thrilled her tales are now worth more than ten cents. As an author and in speaking with many authors, we love to have readers contact us on social media. 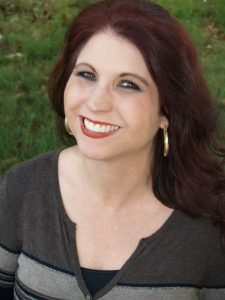 If you want to learn more about Anna Kittrell and her awesome writing, be sure to visit the following: Anna’s website, appropriately entitled Anna Kittrell, her Facebook Author’s page, The Commandment Facebook page, Amazon Author Central, and Anna invites you to e-mail her. You can also take a look at Anna’s wonderful book trailer for The Commandment. Be sure to join us here at Inner Source on Wednesday when we discuss Anna’s latest release with her, and on Friday (the release date for The Commandment), Anna shares a heartfelt blog about her journey in writing the story.